Synonyms: · 1,2-Ethanediol; Glycol alcohol. Physical Appearance: · Colourless, syrupy, odourless, non-volatile liquid, with a bitter-sweet taste. · Colourless, syrupy, odourless, non-volatile liquid, with a bitter-sweet taste. · Antifreeze: Ethylene glycol lowers the freezing point ofwater. More than 25% of the ethylene glycol produced is used in antifreeze and coolant mixtures for motor vehicles. · It is also used widely for aircraft deicing, and used in condensers and heat exchangers. · As a glycerine substitute in commercial products such as paints, lacquers, detergents, and cosmetics. · About 70 to 100 ml (1.4 ml/kg or 1.56 gm/kg). Ethylene glycol is not absorbed through skin, and because of its low vapour pressure does not produce toxicity upon inhala-tion. It is however rapidly absorbed through the GI tract and is metabolised (more than 80%) to glycoaldehyde, glycolic acid, and oxalic acid which inhibit diverse metabolic pathways in the body, including oxidative phosphorylation. Other metabolites include glyoxylic acid, glyoxal, formic acid, glycine, oxaloma-late, malate, benzoic acid, and hippuric acid. First Phase (CNS stage): upto 12 hours post-ingestion. · This stage is mainly due to the parent compound itself and is characterised by vomiting, inebriation, lethargy, nystagmus, ataxia, convulsions, and coma. · Facial paralysis, strabismus, ophthalmoplegias, papil-loedema, mydriasis, retinal injury, and eye and throat irritation may occur. Second Phase (CVS stage): 12 to 24 hours post-ingestion. · This stage is characterised by tachycardia hypertension (sometimes hypotension), tachypnoea, congestive heart failure, and circulatory collapse. · Severe metabolic acidosis with compensatory hyper-ventilation can develop with multiple organ failure in significant poisonings. Tachypnoea and Kussmaul’s respiration may be the first clinical signs of developing metabolic acidosis which, if untreated, can progress and become life-threatening. · Cardiogenic pulmonary oedema may occur with severe poisoning. Third Phase (Renal stage): 24 to 72 hours post-ingestion. · There is oliguria, flank pain, acute tubular necrosis and renal failure. Urine contains calcium oxalate or hippurate crystals. Calcium oxalate crystals are found as monohydrates (prism or needle-like) or dihydrates (tent or envelope-shaped). The former may resemble sodium urate crystals. Hippurate crystals are produced by the transamination of glyoxalate to glycine. It is important to note that absence of calcium oxalate crystals does not rule out the diagnosis. Haematuria and proteinuria are common. In surviving cases, renal function usually returns to normal, but in some cases permanent renal damage has occurred. · Hypocalcaemia results in manifestations of tetany. · Delayed onset of adult respiratory distress syndrome (ARDS) has been described after ingestion of ethylene glycol. · High anion gap acidosis: Increased anion gap metabolic acidosis results from the metabolism of ethylene glycol to acidic metabolites, predominantly glycolic acid. · Osmolal gap: Normal anion gap is 12 to 16 using the formula AG = (Na + K) – (Cl + HCO3), but may vary from laboratory to laboratory.The osmolal gap may be used to estimate the serum ethylene glycol level (in mg/100 ml) by simply multiplying the gap by 6.2 (the molecular weight of ethylene glycol/10). This method assumes that the patient’s serum contains only ethylene glycol (and no other osmoti-cally active substances such as ethanol). 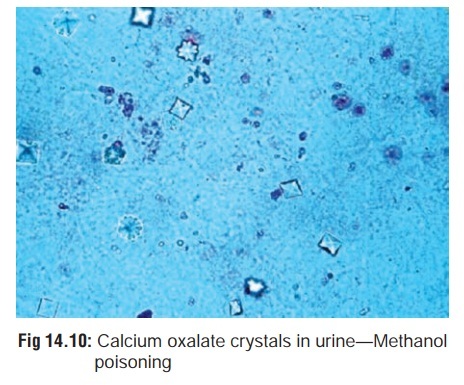 · Calcium oxalate crystals in urine (Fig 14.10). · Xanthochromic CSF with pleocytosis. · Determine blood ethylene glycol concentration in all patients. Ethylene glycol concentrations must be inter-preted with regard to the time of ingestion and the acid/ base status of the patient. Shortly after ingestion ethylene glycol concentrations greater than 30 to 50 mg/100 ml (8.06 mmol/L) are frequently associated with severe intoxication. In severely acidotic or acidaemic patients lower ethylene glycol concentrations may be associated with severe toxicity. · If antifreeze has been ingested, the urine will fluoresce from the fluorescent dye in the product, when examined under Wood’s lamp. A fluorescent dye, sodium fluorescein, is present in many commercial antifreeze products. However, fluorescent urine is not a reliable indicator of ethylene glycol ingestion, due to variations in interpretation of urine fluorescence among observers and the fact that most normal urine specimens exhibit some degree of fluorescence. –– If the fluorescein content is not listed on the container, a sample of the product should also be examined for fluorescence. –– Urine samples should be collected as soon as possible after ingestion, preferably within 2 hours and absolutely within 4 hours. A spectrofluoropho-tometer is more sensitive than visual inspection. –– Urine must be collected using non-fluorescent containers (i.e. borosilicate glass test tubes). Plastic specimen containers are fluorescent. –– The pH of the urine should be checked and adjusted to 4.5 or greater before examination. 1. Stomach wash and activated charcoal. However, the utility of activated charcoal is limited due to ethylene glycol’s rapid absorption from the GI tract and its poor binding affinity for activated charcoal. Unless there is concern for coingestants, there is little benefit from acti- vated charcoal administration in ethylene glycol inges- tions. 2. Ethanol is the antidote and must be given IV, (same as for methanol poisoning). It inhibits the metabolism of ethylene tive. -- Serum bicarbonate less than 20 mEq/L -- Osmolal gap greater than 10 mOsm/L -- Urinary oxalate crystals present. -- Administer 7.6 ml/kg IV of 10% ethanol (V/V) in dextrose 5% in water over 30 minutes to achieve a blood ethanol concentration of above 100 mg/100 ml (21.7 to 28.2 mmol/L). Some authors recommend a loading dose of 10 ml/ kg to ensure an adequate initial level despite variability in ethanol distribution and ongoing metabolism during the infusion. -- 95% ethanol: Administer 0.8 to 1 ml/kg orally in 6 ounces of orange juice over 30 minutes. -- 40% ethanol: Administer 1.8 to 2 ml/kg orally in 6 ounces of orange juice over 30 minutes (80° proof spirits contain 40% ethanol; for 20% (40° proof) spirits administer 4 ml/kg). –– Dosing to maintain a blood ethanol level of 100 mg/100 ml (21.7 millimoles/litre). Begin main-tenance infusion as soon as the loading dose is infused. –– Determine blood ethanol concentrations at the end of the loading dose and hourly thereafter until stable levels of 100 to 120 mg/100 ml have been achieved. Monitor blood ethanol concentrations at least three times daily once a stable ethanol infusion has been achieved. –– Patients who have concurrently ingested ethanol and ethylene glycol may have a normal acid-base profile and urinalysis despite a dangerously elevated blood ethylene glycol concentration. Consider implementing the ethanol treatment regimen in these patients until an ethylene glycol concentra-tion can be determined. Determine blood ethanol concentration before beginning antidotal therapy and modify the loading dose accordingly. d. Dose (fomepizole): An initial loading dose of 15 mg/kgis intravenously infused over 30 minutes followed by doses of 10 mg/kg every 12 hours for 4 doses, then 15 mg/kg every 12 hours until ethylene glycol concentra-tions are below 20 mg/100 ml. –– Serum glycolic acid level > 8 mmol/L. 5. Pyridoxine 50 mg and thiamine 100 mg IM, 6th hourly for 2 days. Thiamine is recommended to stimulate the conver-sion of glyoxylate to alpha-hydroxy-beta-ketoadipate, a non-toxic metabolite. Pyridoxine is recommended to allow adequate stores of cofactor necessary for the conversion of glyoxylate to nontoxic glycine. 6. Monitor serum calcium level and replace as indicated, with 10% calcium gluconate IV. 7. Maintenance of good urine volume enhances urinary elimi-nation of ethylene glycol. · Cerebral oedema, chemical meningoencephalitis. · Toxic damage of liver and kidneys. · Oxalate crystals in brain, spinal cord, and kidneys.